We'd been to Melbourne once before in 1999 and really wanted to come back since we liked the city so much in 1999 that we consider a place we'd love to live one day. Instead of staying in the city straight away, we picked a Servas hosts in the suburbs. We liked the entry that Alan & Lorraine had written for Servas, so we rang them up one day before we were arriving in Melbourne and arranged to stay at their house. It was nice seeing that they'd written "love visitors" since we do always feel a bit timid going into someone's home. Lorraine picked us up from the local Kooyong train station and we went home to meet Alan. He was working in the garage and it was obvious that he loved cars! There were at least three cars and various other parts spilling out of their garage. 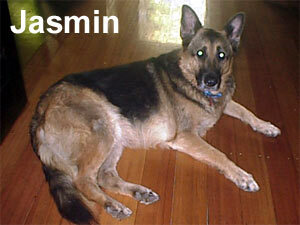 We met Jasmine, their dog, straight away and even though she was a German Shepherd, she was friendly. 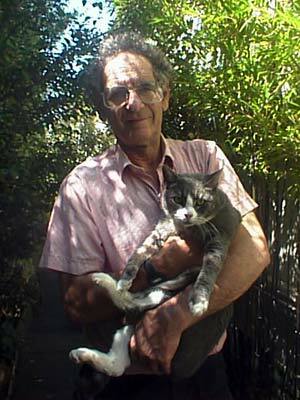 We also met Sam, a British Shorthair gray cat (who Alan is holding in the photo); Tequila, a long hair brown/black/white mixed cat; and Tigger, a long hair light gray cat. The new baby cat, Loki, was not around, so we met her for a brief moment the next day. It was fun having animals around the house. We really miss having pets since moving away from Chicago, so we like to stay in houses with pets. Sam was especially friendly and Alan attributed this to her breed. SEth spent one whole night petting Sam while watching TV. 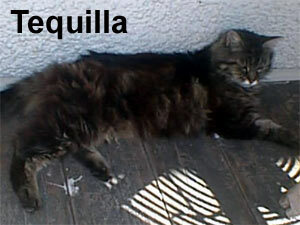 Tara thought Tequila was also very friendly. She pet her outside on the balcony often. 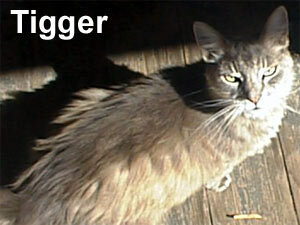 Jasmin and Tigger were also friendly, Loki was the only one who made herself scarce. What better thing to do than get the Rolls out for a Sunday drive about town. 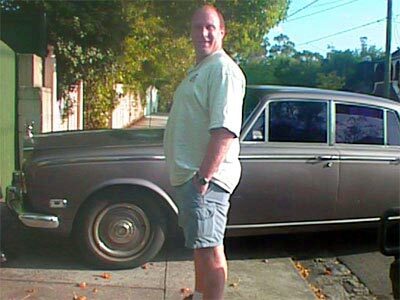 The easiest car to extract from the garage was the 1970 Gray Rolls Royce. We were told that this one was not as nice as the 1982 Blue Rolls Royce. However, to us, the 1970 Gray Rolls was pretty spiffy! It had all sorts of neat gadgets inside like vanity mirrors for the passengers in the back seats. Nice, plush leather seats and electronic windows! All this in 1970 even. We really enjoyed seeing the suburbs of Toorak, South Yarra and St. Kilda from the back seat of a Rolls Royce. We stopped twice in St. Kilda to take photos at Luna Park and have some drinks in a cafe at the beach side. It was neat hearing about their business since it was a family run business that served a niche market. Alan owned instant photo machines around Melbourne. We wish we could think of some small niche and start our own business. We learned a lot about the booths and photo developing process. The most surprising fact was how old the black and white photo machines actually were. I think I remember 40 years! He treated us to the photo strips you see lining this page. After our drive round town, we met Alan and Lorraine's son Damian, plus Lorraine's mother and brother. Going to Pinnoccio's for an Italian dinner is a weekly family event and we were invited along. The only family member not in attendance was their daughter Kate. We enjoyed a very yummy meal. Seth's plan to limit his food went by the wayside when he tasted the lasagna he'd ordered. Tara, though, did manage to leave 25%. We also enjoyed "talking" to Damian. Since Damian is deaf, we would actually write little notes back and forth. We didn't realize that different country's sign language was so different. Both of us know some bits of the ASL (American Sign Language) alphabet, so we could immediately see that the Australian version was vastly different. The older version even involved two hands. The next day was a day of complete and total relaxation. We did have lofty goals of going into town, but by 2pm, we decided just to stay around their house. 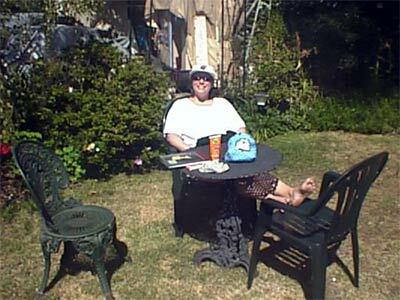 Tara loved it since she could sit outside in the sun at a small table studying Japanese for hours and hours. She was especially happy since she devised a study-plan to ensure she knew all the Level 3 Kanji by heart 100% using a new book she'd bought in Chicago (A Japanese Reader by Roy Andrew Miller). If she got a little too warm in the sun, she just switched to another table and chairs in the shade for a while. It was also perfect for Seth to stay home since he'd been up late playing computer games and he could take a nap. He also wrote a lot of e-mails. Our bedroom was tucked away into a top floor loft and Seth was completely happy being inside up in the loft was Tara was outside in the garden. For dinner that night, we went to Alan and Lorraine's favorite French restaurant, Bonsoir. On Monday nights, the restaurant served couscous which had been a favorite of their since a trip to Morocco. We typically don't eat French food since we have no idea how to order what we like. Thus, our choice was made easy since Alan and Lorraine ordered everything. We actually REALLY liked the couscous and would order it again if we find ourselves in a French restaurant. Seth had had it before, but dry. This time it was prepared with a yummy curry-ish soup poured over it. The next day we had a relaxing morning and got to meet a brilliant man who had come over to give Lorraine a computer class. It was great to talk with another geek. We played a fun game of "guess the acronym". Tara lost. She just always thinks of a PDF file as a PDF file, but both Seth and David knew the meaning behind the letters. In the end, David won since he knew many, many obscure acronym's. To Lorraine's non-computer-accustomed ears, I'm sure it sounded like we were speaking a foreign language. The fact that David was a "speaking deaf" person had been explained to us beforehand, but the actual fact that he could distinguish us as Americans from lip reading alone was outstanding. To Tara lip reading seemed similar to learning any foreign language. David explained how he guesses at 50% of what is said and how if he has a context to put the conversation in, his comprehension is much better. We think that his guessing was really good, since it was very easy to hold a conversation. Yet again, we were so surprised at how welcome our Servas hosts made us. It was an enjoyable experience and we hope to stay with more Servas families. 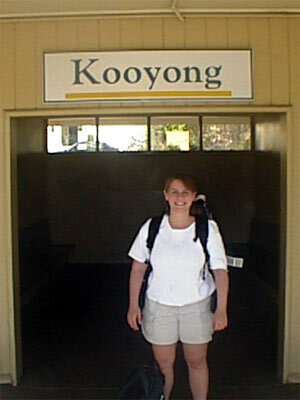 After two nights, we were back at the Kooyong train station and heading into the center of Melbourne. Overall Experience 8 We couldn't have asked for a nice stay. Ease of Journey 8 no problems. Accommodation 9 Great little dormer room in their attic. A really nice bathroom exactly the size we'd hope to have one day with a Australian type many, many holed shower head. Activities 10 Tooling around town in a Rolls Royce, enjoying an Italian dinner and a French dinner, plus relaxing with Seth inside & Tara outside in the sun the whole day through. Coolness 8 Having friendly animals around was almost as kool as riding in a Rolls. AUD 66 per person one way. The Qantas Club lounge at Sydney's domestic terminal is excellent! www.qantas.com.au for AUD 69.74 per person one way.